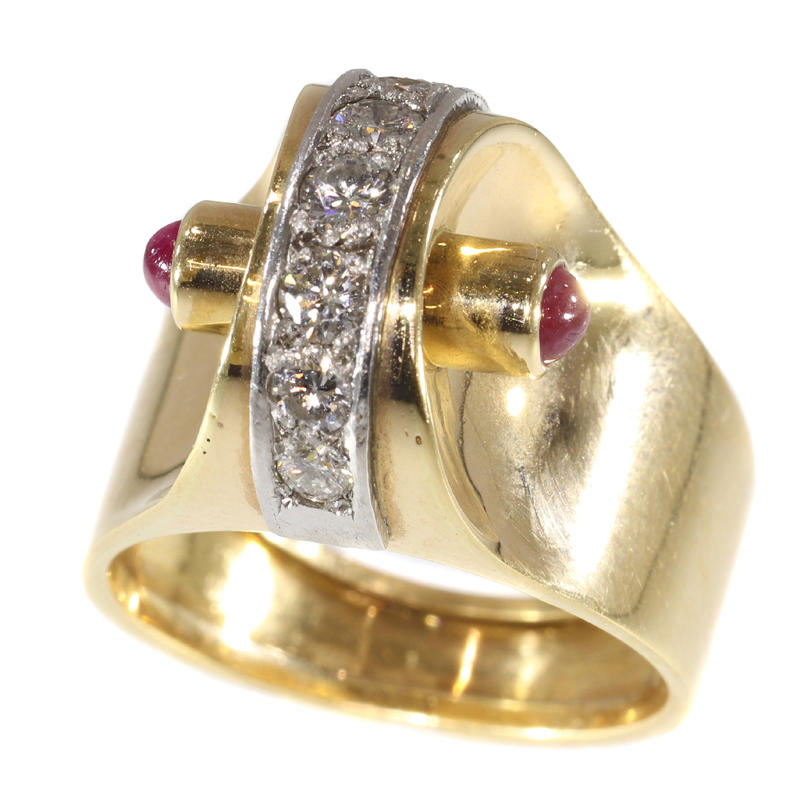 Extrovert and stylish red gold vintage Art Retro ring with diamonds and rubies: Description by Adin Antique Jewelry. This 18K red gold Retro ring from 1940 seems to be crafted gradually from the shank to the top into a stylized wheel with a vertical alignment of seven semi-modern brilliant cut diamonds encrusted in white gold following the arch of the wheel. With two rubies as the extremities of the axis, this powerful jewel could be your personal wheel of fortune right at your finger. Diamonds: 7 semi-modern brilliant cut diamonds with a total estimated weight of approx. 0.48 crt. Their cut is semi-modern as the stones are polished around 1950 which means that although to today's standards they are considered to be modern brilliant cuts, their cullet (the point at the bottom) are still polished flat. Total diamond weight: approx. 0.48 crt.